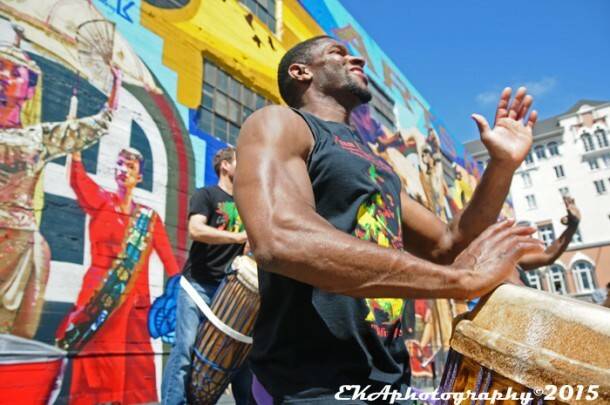 Oakland’s Malonga Arts Center is known for the sounds of drumming and dance emanating from within; this past Saturday, those sounds came from the parking lot across the street. Culminating a project two years in the making, Oakland-based cultural arts collective Community Rejuvenation Project (CRP) celebrated the completion of Phase II of its Alice Street Mural Project with a vibrant, joyous block party June 6, held in the parking lot at Alice and 14th Sts., surrounded by the project’s four colorful, character-driven walls. Approximately 400 cans of aerosol paint and six weeks of painting time went into the final wall, which rises a towering 40 feet in height. 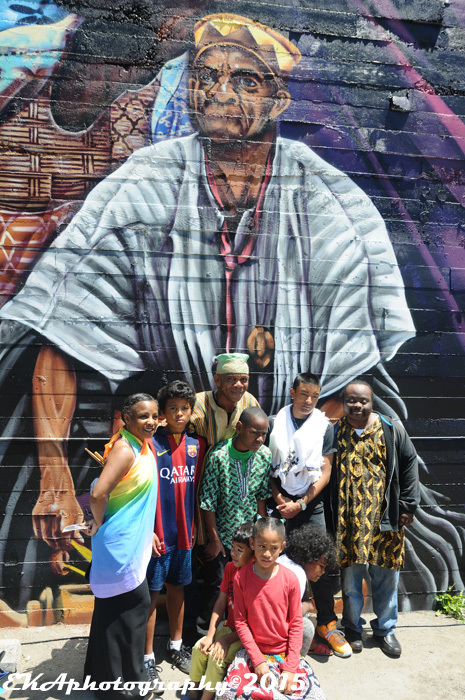 Where previously, the wall had been a blighted eyesore detracting from the world-class dance, theater, and music being produced out of the Malonga Center, the mural now pays visual tribute to African, Brazilian, Afro-American, Filipino and Chinese arts practitioners. Many of the figures on the wall (as well as several culture keepers and community leaders painted during 2014’s Phase I) were in attendance, which made the occasion even more auspicious. There were many highlights throughout the afternoon. 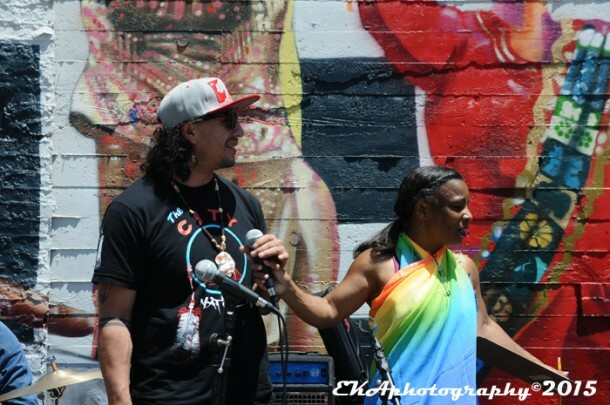 Host/MC Carla Service introduced Tacuma King, co-founder of Children in Flight and Bay Area Youth Arts – a founding organization of the Malonga Arts Collective–, who opened up the proceedings with his young drum disciples. 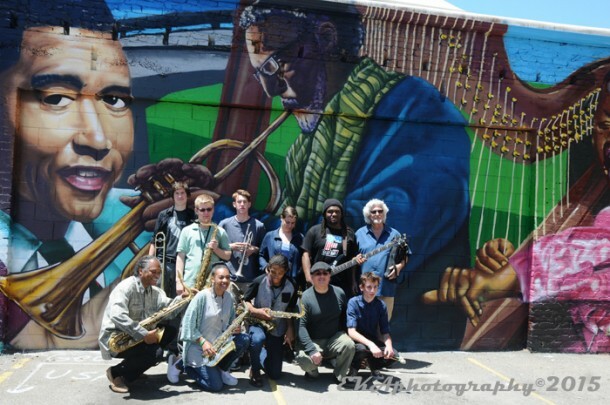 Oaktown Jazz Workshops , headquartered for many years at the Malonga Center, followed with an extended jazz set dedicated to their founder, the late Kahlil Shaheed (also tributed during Phase I). 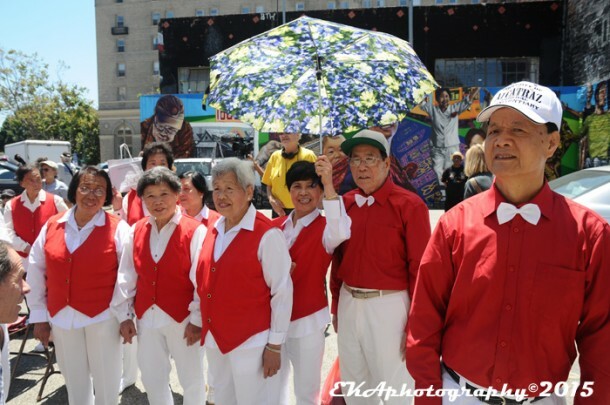 Service noted that the mural represents not just the Malonga Center, but also the “Chinese brothers and sisters of the Hotel Oakland,” and introduction to the red-and-white suited Hotel Oakland Choir and Dancers, who offered up a demonstration of traditional Chinese-style line dancing. 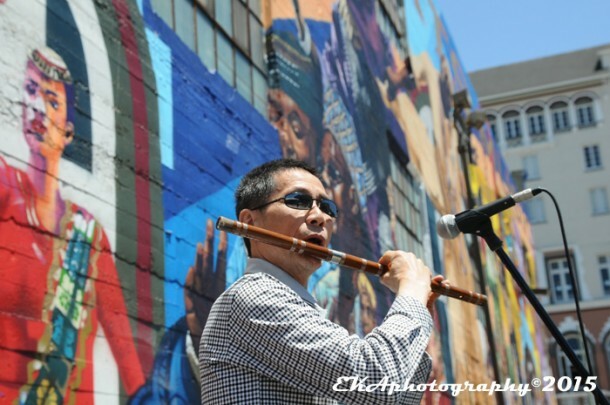 Sam Tsang, the senior community center’s resident flutist, who serenaded CRP lead artists Desi and Pancho every morning as they arrived to paint, followed next. 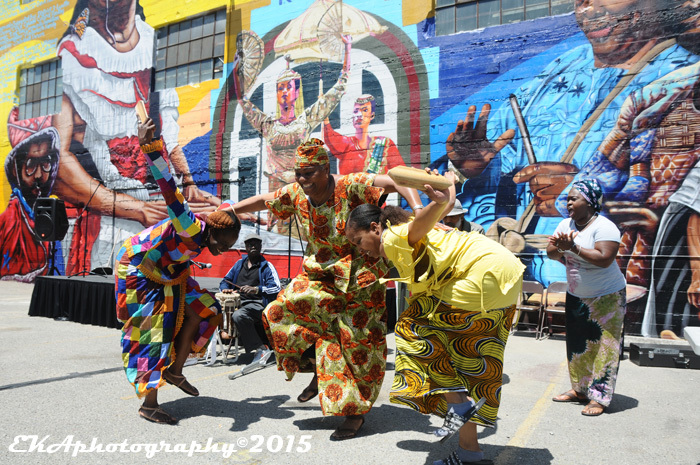 City of Oakland Cultural Arts Dept. 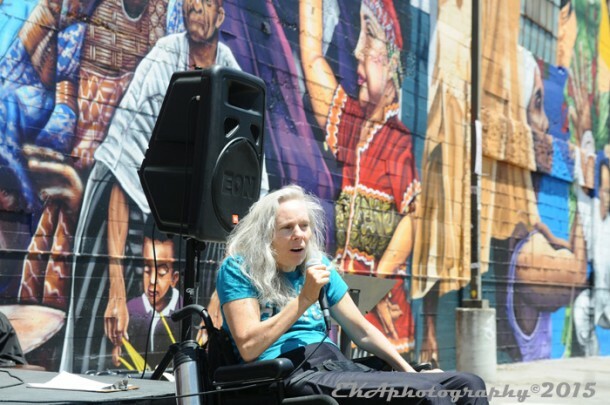 staffer Denise Pate then spoke about the mural. 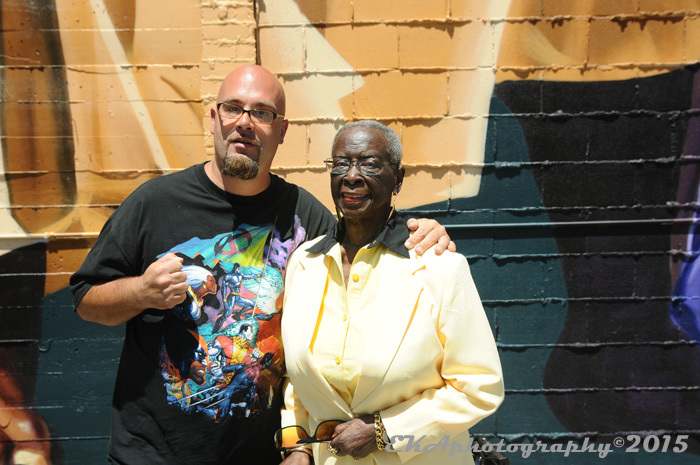 Pate noted the many hoops CRP had to jump through to complete the project and that she recognized many of the people pictured in the mural. 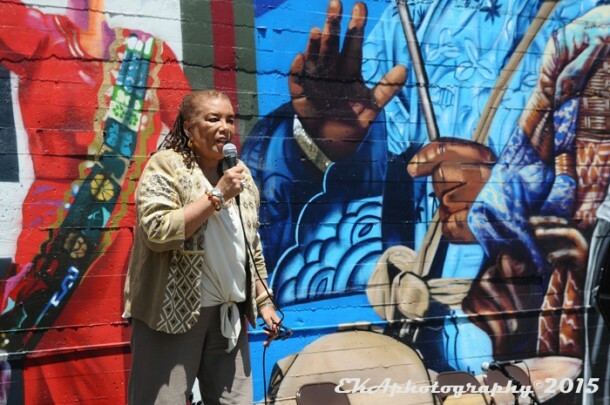 “This is a real beautiful chronicle of our arts and social justice and cultural richness in the city of Oakland,” she said. The next speaker was Alice Arts Center co-founder Halifu Osumare, who shared anecdotes about her dance troupe, City Center Dance Theater/Everybody’s Creative Arts Center. She noted that the image of her pictured on the wall was from her time in Ghana, where she was inspired to start her company. The Dioufs and Diamano Coura then threw down with their expert-level West African dance/drumming, pulling people out of the crowd to join in the dance. 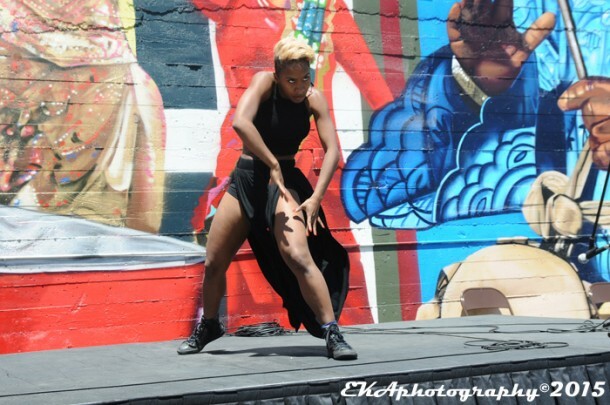 Following Reece, Dance-A-Vision dancer Najah Miller performed a powerful solo piece affirming pride in blackness. Offered the mic by Service, Miller related how she started dancing at the Malonga Center at the age of 11. “Malonga has been a family area for me to come back to. I know that it will always be here for me,” she said. 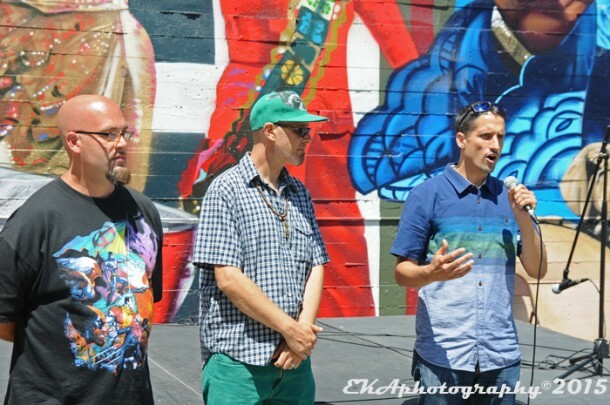 CRP founder/Executive Director Desi Mundo, co-lead artist Pancho Peskador, and documentary filmmaker Spencer Wilkinson all spoke about their experiences in making the mural coming to life. “For the past two years, [CRP has] been focused on trying to tell the story well, by doing the research on the community, by interviewing many of the members of the community, to really learn about the story,” Wilkinson said. “I’m very proud of the work and will keep working for the people always,” said Pancho. 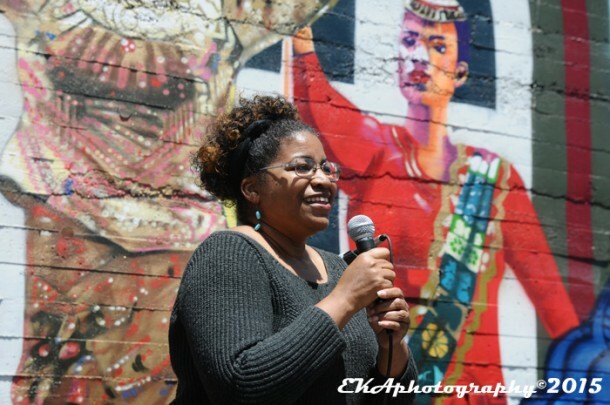 “We hope to do many more of these projects where we can continue to represent for Oakland and tell the history of things that have happened here,” said Desi. Then came Kiazi Casquelourd aka Kiazi Malonga, son of Malonga Casquelourd, who had just finished teaching a class at the center named for his father. 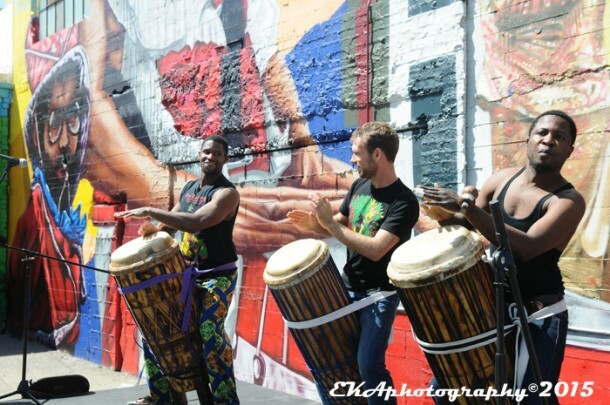 Kiazi helmed a drum trio which displayed the Congolese style of African drums. 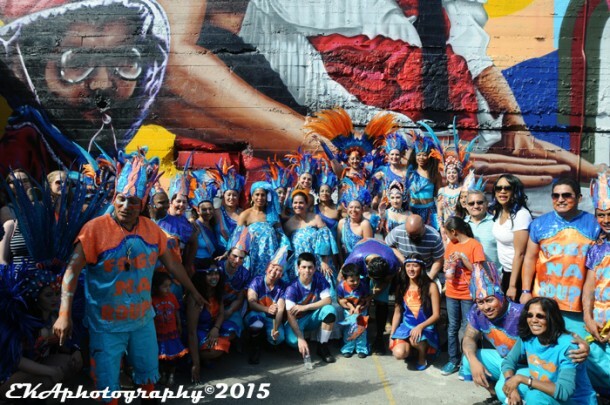 After a break, the parking lot was suddenly filled with the blue and orange uniforms of Fogo Na Roupa, the Brazilian dance troupe founded by the late Carlos Aceituno, and now led by Jose Rivera. Both Aceituno and his mentor, Samba Batucaje’s Jose Lorenzo, are depicted on the wall. 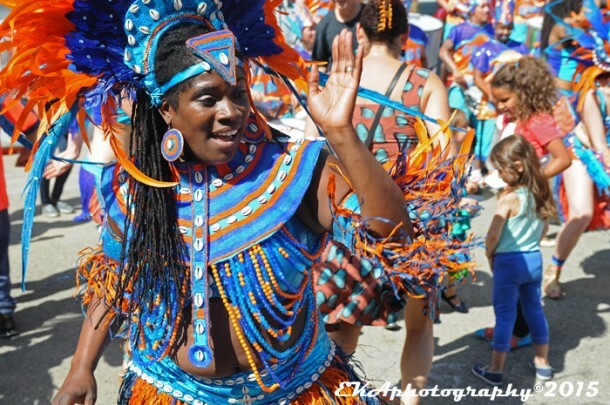 Fogo Na Roupa went all out, bringing Carnaval to Oakland in June. 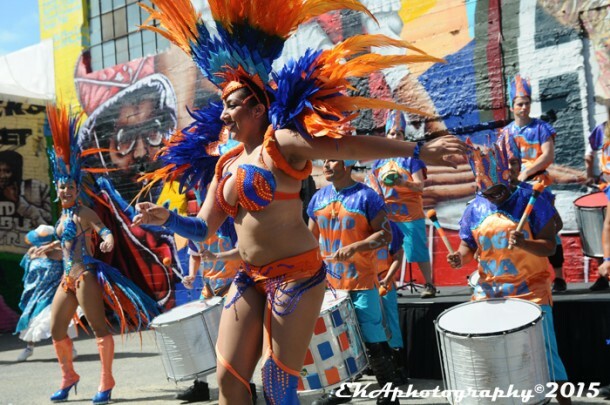 As Rivera and a backline of drummers kept the beat steady, wave after wave of dancers entered in succession. From an observer’s point of view, it was revelatory to see the pioneering Afro-Brazilian dance company—long since relocated to San Francisco—back in Oakland. By the end of Fogo’s performance, nearly everyone in the crowd had become a participant in the dance. 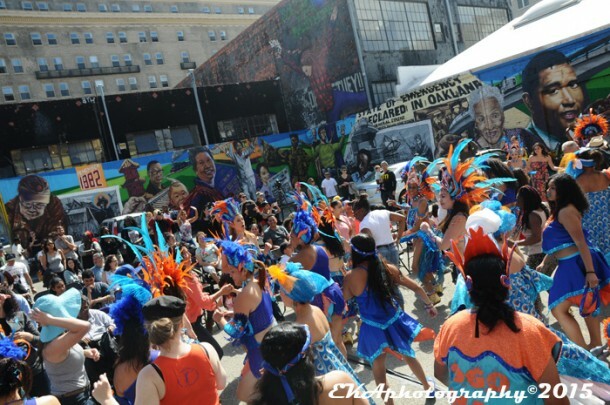 It was a fitting way to end an afternoon which transformed a bland parking lot into a cultural space, while perfectly illustrating the central themes of the mural: celebrating movement, multiculturalism, culture-keeping, and rhythmic expression. 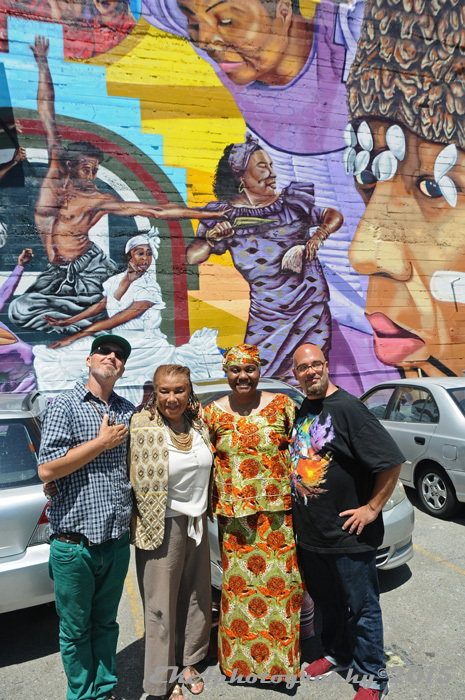 Looking back at the two-year journey to realize the Alice St. Mural, it’s been an amazing ride for everyone here at CRP. 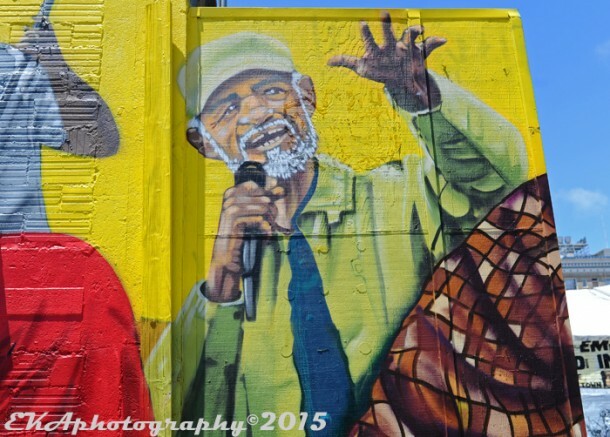 The process has taught us more about neighborhoods, community, and Oakland history than we ever could have imagined and has positively changed our perceptions of what public art can and should be. While it was challenging, at times, to deal with some of the obstacles which presented themselves along the way, few things worth doing are without challenge. 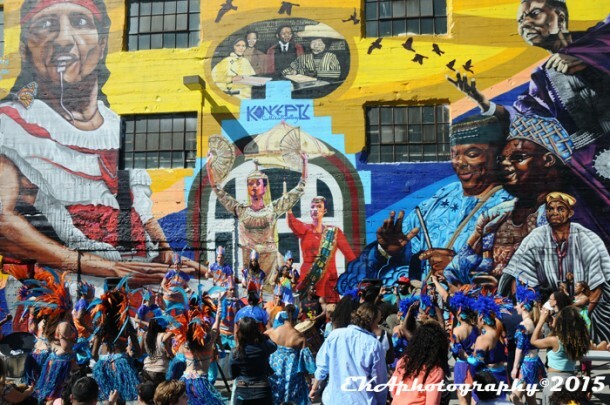 We hope that this mural will inspire Oakland’s cultural resilience as much as Oakland’s cultural resilience inspired it. Much love to everyone who supported the project and/or came out on Saturday.